The Engadine region of eastern Switzerland delights visitors with great hikes, delicious cuisine, and a culture that is truly unique from the rest of Switzerland. The architecture is different, the local dialect is mysterious, and the food presents a mouth-watering flavor that is all its own. Real Eats contributer Janice Caplan wrote a nice piece about her self-guided hiking tour through the Engadine, and she wrote with a special emphasis on the food. We think she did a great job of capturing the spirit of our Engadine Trek. Check it out for yourself, but be forewarned; you’ll want to splurge on a plane ticket to Switzerland right away. Hiking inn-to-inn in Switzerland’s Engadine Valley can feel magical. The mix of breathtaking scenery and Swiss hospitality was so exhilarating during the week I explored the region with my husband Ron and our younger son Matt that I suggested almost immediately we should stay there forever… Read the full article. 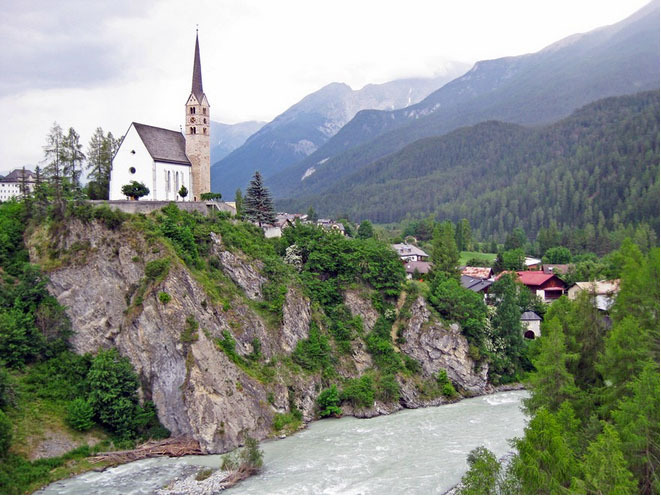 Image: A church tower in the picturesque village of Scuol, Switzerland.